Animal teeth and claws easily puncture skin, introducing bacteria under the skin of the affected animal. If the skin heals quickly the bacteria become trapped, which creates infectious pockets that are commonly referred to as abscesses. Abscesses may be very small or extraordinarily large, and may feel swollen and warm. These wounds are often extremely painful. Typically, animals with abscesses become depressed, and may exhibit a tendency to hide in inconspicuous places in the home. Occasionally abscesses may rupture prior to the onset of any other signs. Tooth root abscesses typically form just below the eye, and start as a bump or swelling. This can present differently in pigs though, they may stop eating or have drainage from their mouth or exhibit the classic signs of infection with swelling and painful areas on the mandible. They may break open and bleed, and the pig may stop eating due to the pain or experience pain upon chewing. Small, uncomplicated abscesses may respond to medical therapy, while larger and more extensive abscesses may require surgical treatment. Proper surgical management of abscesses often requires the placement of a drain or latex tubing (either under sedation or general anesthesia) to provide an escape route for secretions from the damaged tissues of the wound. Tooth root abscesses require tooth extraction or I&D (incision and drainage) – antibiotics alone will only lead to a temporary solution, but the abscess will recur unless the affected tooth is pulled. This surgery requires general anesthesia. Abscesses should be examined by a veterinarian as soon as possible and within 24 hours. Fluid may normally drain from the site of an abscess. An abscess does not drain through the tube, but rather around the latex tubing. Therefore, it is important for you to clean the area around the drain twice daily with warm water. Apply a hot compress to the affected site at least two times daily for 3 to 5 days after the animal leaves the hospital. Wet a clean washcloth with very warm water and place it directly over the affected site, and then apply gentle pressure ideally for 5 to 10 minutes. Be sure you and/or other family members wash your hands thoroughly after contacting any fluids draining from the abscess site. 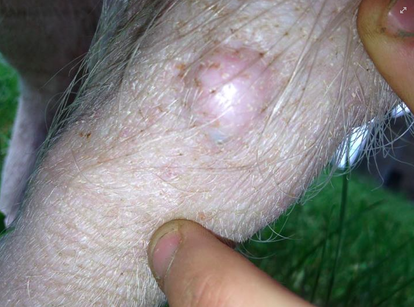 If you are unsure about an abscess and whether or not it is serious, take a temperature (you should know your pigs normal core temperature already) and mark the abscess to see if it is growing or staying the same size. you can use a pen or marker to draw a circle around the lump to determine if its growing and how quickly its happening. Notify your vet of your findings. Be sure to administer all prescribed medications exactly and completely as detailed by your pet’s veterinarian. Some patients may appear to feel better after only a few days of treatment; however, it is crucial for medications to be administered according to schedule to prevent the infection from recurring. Failing to give the appropriate amount of antibiotics for the proper amount of time can lead to a "super infection". Restrict your animal to indoor activities until the infection has resolved completely. This is especially important for pigs that like to spend time outside in a mud hole or rolling around in the dirt. An open area is an obvious way for worse bacteria to invade the body resulting in far worse infections to enter and take over. Do not attempt to open the abscess yourself. Do not attempt compressing the wounds of a pig that is out of control or panicked. Your safety is of utmost importance to us. Contact your veterinarian for assistance should this situation arise. Do not apply medicines, potions, or home remedies unless directed by a veterinarian. Click here to review basic and advanced wound care instructions.